A litterateur of a grand heritage, the grandson of Syed Ismail Hossain Shiraji, Hossain Mahmud is a poet, editor, translator and journalist. He has to his credit written, edited and translated 20 books. 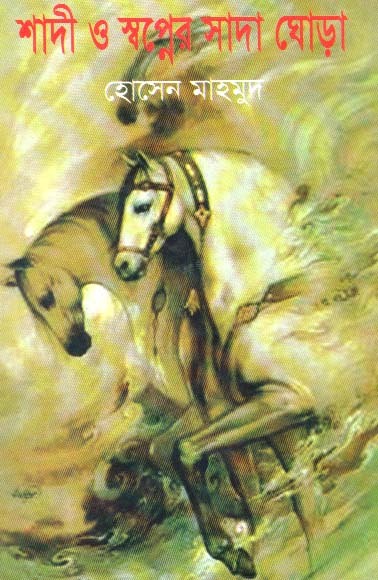 'Shadio O Swopner Sada Ghora' (Shadi and the winged white horse of dream) is a book of twelve juvenile short stories translated by him and recently published by Globe Library (Private) Ltd. The stories have been taken from internet . The stories are not for very youners, but for the juvenile. This is a period of life, when the feeling of dream and imagination goes on fading and the truth and reality of life appears. Every story bears such a background and environment. The stories present joy, fun, education and inspiration. This a pioneering compilation in this sphere. The first, 'Bondhu' is a story of deep love for friend. 'Winter oak' describes a boy's love for nature, who was a destitute. 'Onyorokom bondhu' is a story of love for birds. 'Nizer bari' an unlucky boy's thievish activities, then repentance and soft feeling. 'Khuli lake' -some amusementseekers' crime begotten from ignorance, and consequences. 'Nak' -comic activities. 'Shadi o swopner shada ghora' - is of magic and reality. 'Fera' -courage and intelligence of an afflicted juvenile boy. 'Borof jhor' -a steady struggle against hostile situation and survival. 'Muktir pothe'-unyielding will of the people for liberation. 'Akashe Bibhishika' -facing dangerous accidental situation in the air with cool brain. 'Lorai' is a story for survival. The name of the book has been taken from one of the stories, which symbolically represents the dream world of the youngers, an imaginary period of human life. Three of these twelve stories are based on real happenings. This collection of stories for translation to Bengali is a wise choice of the translator. The language and dialogue are attractive. The nice presentation has given these stories the flavour and taste of the original by Arthur Gordon, Yuri Nagibin, Christopher Baroney, Neona, Craigi Domini, Jack London, Pari Mansuri, Julian March, Tara Stroll, Jefry Freishman, Peter Brown and Henry Shilton. The cover is attractive. The book has been dedicated to young writer Mizanur Rahman Mithun. The translator deserves appreciation. We expect wide circulation of the book.